You have probably heard at least a little about thorium. There are certainly advocates out there who strongly believe it could help solve the world’s energy problems. The idea is that thorium-based nuclear energy (it is nuclear) would have all the advantages of a uranium-based system – producing large-scale electricity with low emissions – without any of the disadvantages, real and imagined. Of course, life is a little more complicated than that, otherwise we would have thorium based systems already. In fact, thorium technology in various guises has been around since the start of the nuclear age. But the threat of climate change has thrown the technological challenges facing all energy production into sharp relief. I recently attended a meeting at Parliament House in Canberra entitled “Thorium, a Base Load Power Source?”. The meeting was billed as an international symposium but seemed to be more of a promotional exercise. The proponents were there to tell us why thorium is an attractive option and why Australia should get involved. The meeting was organised by Peter Stepanek from Thorium Energy Pty. 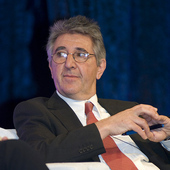 Ltd. – an Australian company with Czech roots – and Bob Stephens from the “green” energy company SDH Australia. The conference was arranged around presentations from members of a consortium including Australians but mainly from the Czech Republic. The Czech delegates were current and ex-diplomats, representatives of key sectors involved in nuclear technology and various university research groups from Pilsen, Prague, Brno and the Nuclear Research Institute in Rez. The aim was to convince us of their cause (thorium to save the world!) and to gain a formal collaboration between the Czech Republic and Australia. This alliance would occur at a political level and through relationships with Australian universities and institutions such as the Australian Nuclear Science and Technology Organisation (ANSTO). While many in the audience didn’t need convincing, the Czech visitors pointed out Australia has lots of thorium as well as the capacity for technological research. It wasn’t clear to me precisely what the lobbyists were after (or why) – there has been a nuclear co-operation agreement with the Czech Republic since 2002. But SDH and others have apparently put real money into a pot to help the project proceed. In this way they’ve temporarily bypassed the vagaries of political negotiations. The interest in thorium is neither new nor limited to the West. Since the early 1950s, India has hoped to develop a thorium-based nuclear energy system in the absence of indigenous uranium resources. However, their current configuration envisages using a fast reactor system for breeding the Uranium-233 isotope from Thorium-232. The plan is to eventually replace the Uranium-235 fuel in their fleet of conventional reactors with the newly-bred Uranium-233. In contrast to the Indian approach, the reactor technology being promoted by the Czechs (and being pursued by the Chinese) is the molten-salt reactor (MSR). There is no risk of proliferation since plutonium is not produced. The first three of these attributes are features of the MSR system itself. MSR uses graphite moderation and a liquid fuel at a relatively high temperature (as the coolant) rather than the water-cooled solid fuel rods found in a typical Pressurised Water Reactor. replenish and modify the fuel as required. The MSR is an elegant and flexible system, but one, it must be remembered, that can also be used with uranium salts, as it was originally. The last two of the above attributes are peculiar to thorium. First, the long-lived alpha-particle-emitters that are a problem in the long-term management of waste from uranium, are not produced from thorium. The waste is more radioactive but shorter-lived. So where are all the molten-salt reactors? MSRs are not currently available at an industrial scale, but test reactors with different configurations have operated for extended periods in the past. But there are a number of technical challenges that have been encountered along the way. One such challenge is that the hot beryllium and lithium “salts” – in which the fuel and heavy wastes are dissolved – are highly reactive and corrosive. Building a large-scale system that can operate reliably for decades is non-trivial. That said, many of the components have been the subject of extensive research programs. At the “symposium”, the Czech consortium discussed their plan to construct a demonstration system on an existing nuclear reactor site. The system would be built some time after 2014 before proceeding to a small prototype (60 megawatts capacity) that would deliver electricity to the grid. Whether that prototype system becomes a game-changer depends on many factors, not least of all the cost of deployment. I sometimes sense more than a whiff of spin in the way thorium is promoted (if indeed spin has an odour). Take, for example, the attempt to distance thorium-based systems from “uranium” and concerns voiced about the “power of the uranium lobby”. I don’t think this is the right approach. Thorium mining and thorium-based reactors in Australia would have to face the same regulatory hurdles as uranium-based nuclear technologies, most of which are currently banned. More egregious is the claim along the lines of: “all of the thorium can be used but only a fraction of uranium produces energy”. This is based on the erroneous comparison between the low abundance of the fissile isotope Uranium-235 in nature (only 0.7% of uranium is Uranium-235) with Thorium-232 (100% of natural thorium). The correct comparison should be between Uranium-238, which is 99.3% abundant, and Thorium-232 which is 100% abundant. Both of these are so-called “fertile isotopes” from which one can breed fissionable material to produce energy. Sadly, this claim of “more energy per unit mass” was repeated by Federal Minister for Resources and Energy, Martin Ferguson in his opening address at the symposium, and is widespread in media reports. Pity. No doubt thorium and other nuclear technologies have the potential to transform energy production. That said, there may be some years to go before that potential is likely to be realised.